Chain stitch is one of my favourite stitches. One of the first stitches I learned, and so simple to do. 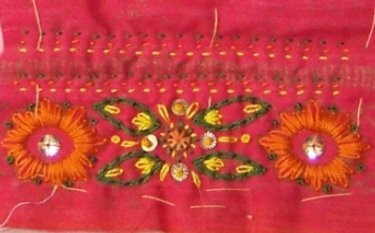 I love to do an outline in quilting or in chain stitches and embellish with more rows of different colours, or sew on a few beads and or sequins. 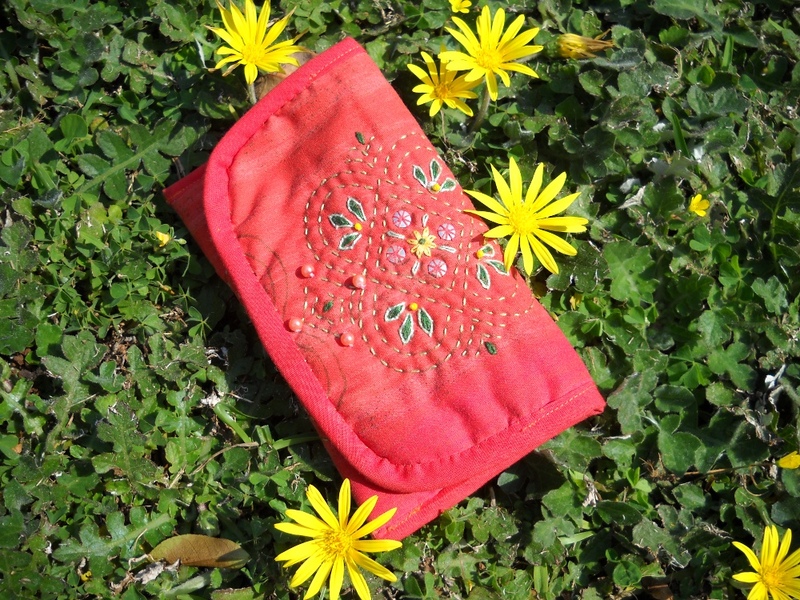 Apart from yoga, reading, meditation and gardening, embroidery is one of the most serene things to do. The more stitches I add the more excited I become to see it grow. It is so absorbing that I lose all sense of time and space. Important though to keep awareness on the needle as an accidental prick is a nasty jerk out of bliss! 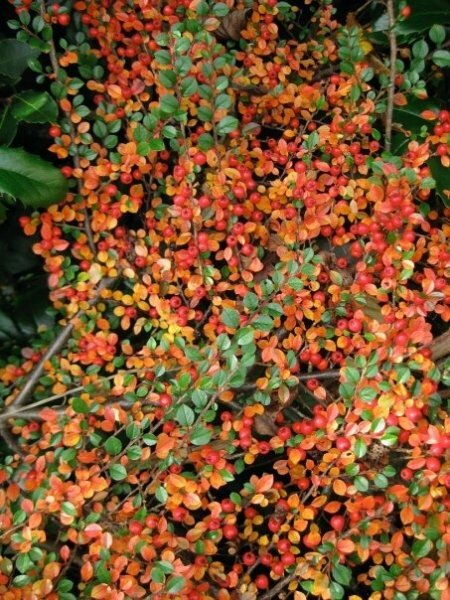 As I was musing over the colours to use with this fabric, my friend Marti posted this picture of her Cotoneaster bush. A picture taken in her beautiful garden in England. This picture was an instant YES to putting this together the way I did. Thank you Marti for your inspiration unbeknownst to you! The other thing that excited me was the fact that these colours are Dad’s favourite hues! This is the caption Marti wrote below the photograph. 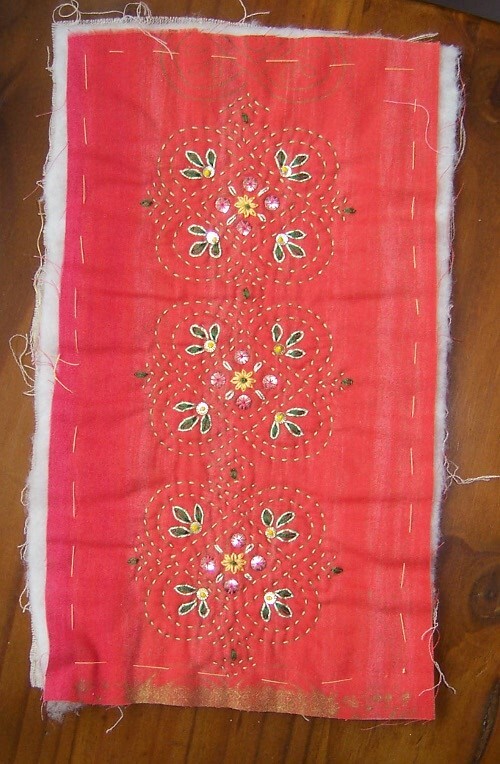 Embroidery is the art of enriching a fabric with stitchery. This piece of fabric was given to me by Annegret. It is an overprint/misprint – a reject. 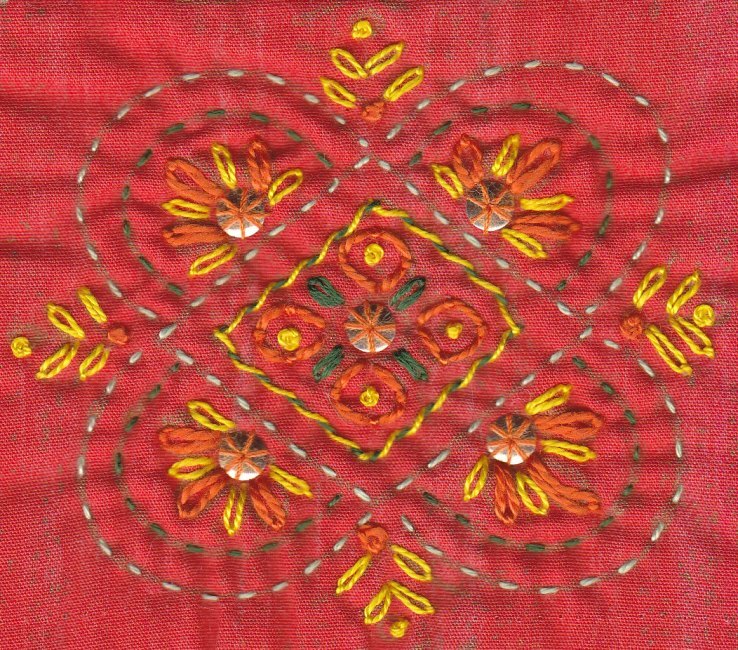 (Printed on the fabric as they were cleaning the rollers) The feint pattern suggested the shapes to me while embroidering. You can just make out the smudges of gold print on the fabric. I used thin batting sandwiched between muslin and the fabric worked on. I love the spongy feel to it and it makes puffy raised pieces in between the stitches. 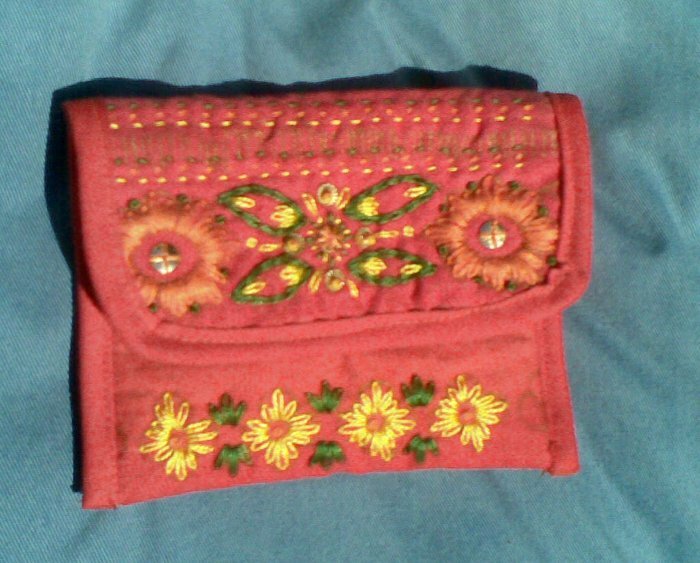 I made it up into a simple press studded purse…bound with bias binding. These “weeds” grow in our back lawn. The flowers are pretty in the spring. Perfect to carry a cellphone. 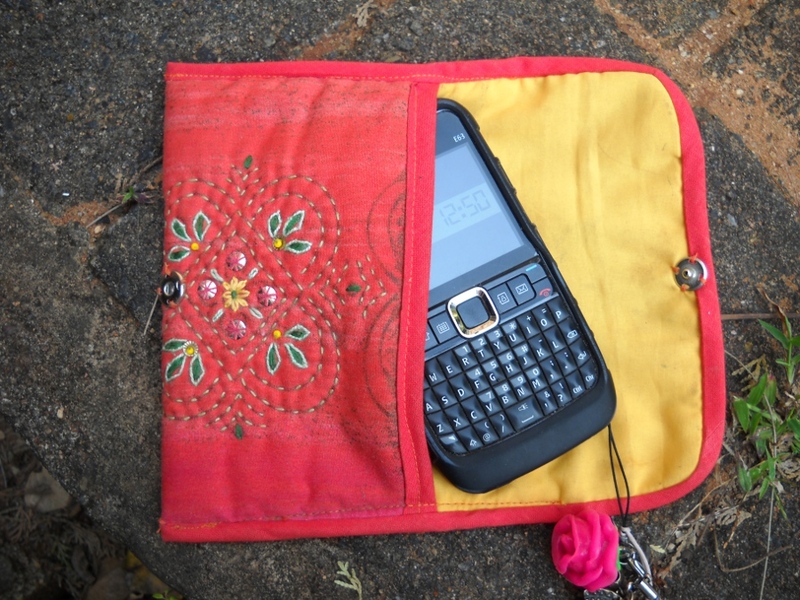 This little purse is the perfect fit for my cellphone. This wasn’t planned….just a perfect coincidence! A nice snug protective fit. 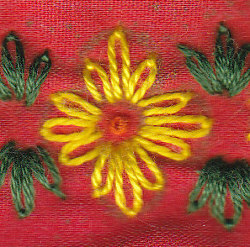 A row of daisies on another section of the fabric that the misprint suggested. Work in progress. Tacking still in place. All this stitching I did quite a while back. This post is to inspire myself and anyone who reads this to do more hand stitching. To make time to find the pleasure of hand work. “It is not that artistic power has left the world but that a more rapid life has developed itself in it, leaving no time for deliberate dainty decoration or labours of love.” Mrs. Orrinsmith 1877. ……and that was a quote from 1877!!!! Sewing was a part of the curriculum at school for me. Nowadays there is no such thing. I was so fortunate to belong to a family that loved sewing. Many an hour was spent in companionship while stitching. Here is a link to very clear “how to” on chain stitch. This is my first post in the embroidery category. I look forward to posting many more! 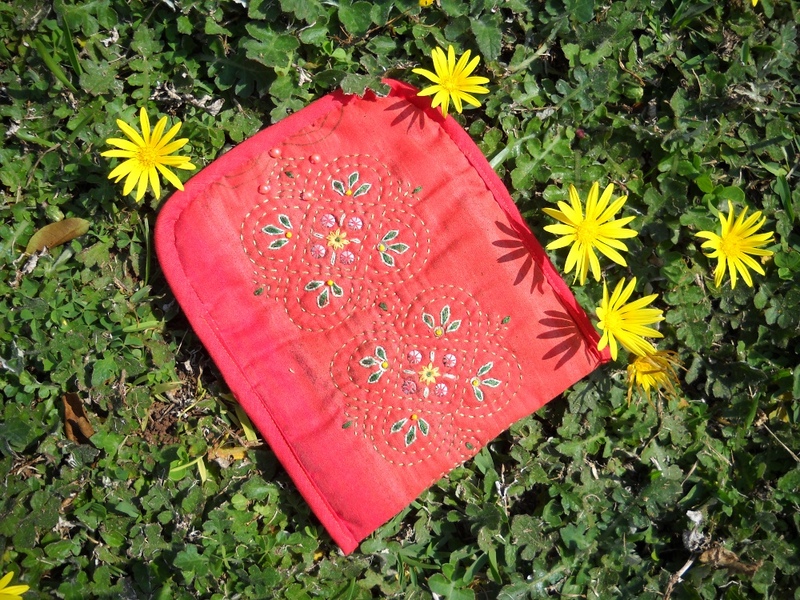 This entry was posted in Embroidery and Quilting and tagged Chain stitch, Cotoneaster, Embroidery, quilting. Bookmark the permalink. Thank you. I appreciated you popping by and leaving a comment!